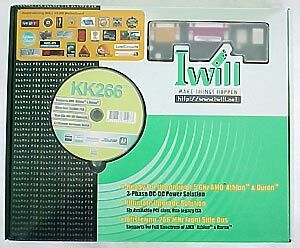 Abstract: The KK266 motherboard from Iwill continues a long standing tradition of providing overclocking friendly solutions. 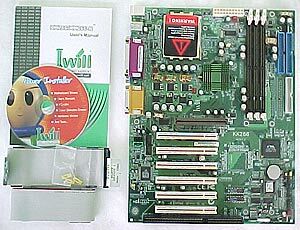 The KK266 motherboard from Iwill continues a long standing tradition of providing overclocking friendly solutions. Based on the VIA KT133A chipset, the KK266 doesn't change all that much from similar KT133A offerings, but that is not to say it is exactly the same either - indeed it is far from from an ordinary motherboard. W here Iwill does differentiate itself, and where in our opinion it does so beautifully, is by gaining the respect of the hardware community for its' almost legendary ability to hit high Front Side Bus (FSB) speeds! When VIA introduced the KT133A chipset, there was actually a bit of disappointment because almost everyone seemed to expect a DDR chipset. Instead we were dealt a SDR solution. Of course, to just about everyone's surprise, the KT133A became quite the sleeper! DDR being such a catch phrase, most people (including yours truly) forgot that in reality, it only allows twice the bandwidth of conventional SDR memory but isn't really 'faster.' By that I mean, the latency stays about the same. The real boost VIA gave average Athlon users was official 133 MHz support! Better yet for overclockers, another tool in the overclocking battle kit! One thing we were taught as kids were to never judge a book by it's cover, but I must say, Iwill has done a superb job on their packaging. It really makes the board stand out from the rest. Well at least by looking at it. While the packaging does look quite spiffy, it actually does a good job at protecting the board from whatever might happen to it. 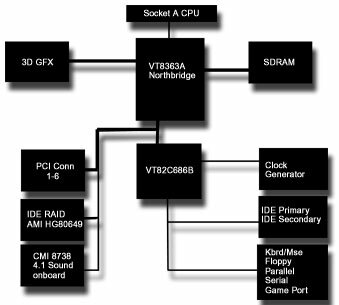 The KK266 features VIA VT82C686B Southbridge in addition to the VT8363A Northbridge. The board supports six PCI cards, one ISA and comes with optional IDE RAID in the KK266-R flavor. Three 168-pin SDRAM sockets can tackle up to 1.5GB of memory - more than most of us will ever need. Onboard audio is standard, but can be toggled off if desired by shorting a jumper. The 2MB EEPROM Bios from Award is easy to use, and has several important features the performance user will want to take note of.